Greenbrier weddings are very special to me. Maran and I were married there ourselves and have fond memories of our own wedding reception on property as well as the opportunity to document many other weddings in the friendly confines of such a historical landmark. Their signature locations include Colonial Hall, the Chesapeake, the Crystal Room, and our personal favorite, The Cameo Ballroom with its stunning chandelier and Christmas decorations for winter events. Driving into the property offers a first glance that almost no other venue can top. In the rural West Virginia landscape, nothing can give a first look at the property just after dusk a run for its money. The lighting and the sheer magnitude of the resort offers first time views a feeling that will not be topped. It is a place all of it’s own. Greenbrier wedding guests can now spend an evening or late night at the casino after wedding festivites wind down. It is the perfect place to mingle and socialize with family and friends, topped off with the hotels professional dancers prominading down the steps to the classic Greenbrier Waltz and coupling that with a champagne toast at ten o’clock. The romatic feeling of strolling the property both inside and out gives couples a feeling of solitude at the late night hours and warmth during the day. The Greenbrier also offers many cottages for wedding guests with family or close friends. The advantages of the cottages is a common living room that you will not experience in a traditional hotel room. This is perfect for many as the staff at the hotel will light a woodburning fire for you and constantly bring you a bottomless pit of fresh logs. I don’t know about you, but the smell and crackle of a woodburning fireplace is second to none. If you were to ask for one suggestion from me, it would be to set up a hot chocolate hour for your guests. This was suggested to us by our wedding coodinator and was a huge hit with the guests. Greenbrier weddings need that something special to warm up the guests on a cold January day. Our wedding guests constantly mentioned how much they enjoyed the hot chocolate and hors douvers at that time. It was, quite simply, a big hit. Greenbrier weddings can give you some rich hot chocolate, which is stunning – it the best, period. We wouldn’t have it any other way. Another approach to Greenbrier weddings that worked well for us was our horse and carriage ride that we took through the Sporting Club property and the golf course. The cost was very reasonable and it provided a nice twenty minute getaway for Maran and me before we joined everyone else. An yes, we did end up with a cup of hot chocolate, something we couldn’t have lived without. 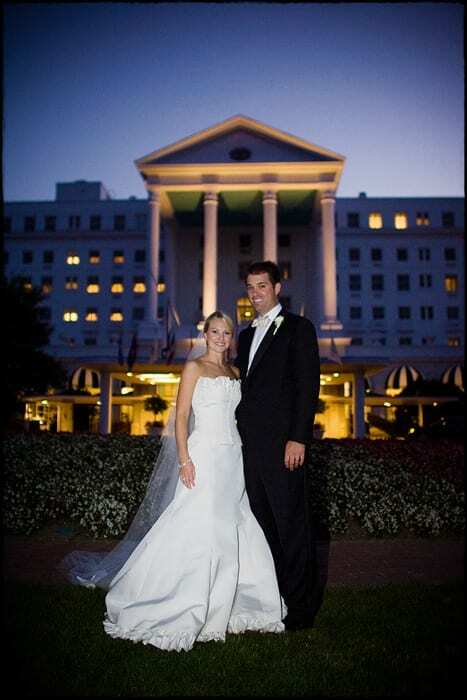 Greenbrier weddings are very easy for Charlottesville residents. The trip itself is only two hours from the center of town and might be the easiest two hour drive anywhere in the United States. Our friends joined us from New York and Washington DC as well, taking the train that drives you right into White Sulphur Springs and the flights from JFK airport in New York takes guests non-stop into Lewisburg, West Virginia making Greenbrier weddings very do-able for the New York City resident. All in all, the experience for us was wonderful. Greenbrier weddings are a must for the bride looking for a classy, intimate affair with plenty of entertainment for guests. Consider this wonderful location as it something you won’t regret. Greenbrier weddings are a must if you are looking for history and elegance wrapped up in one package.